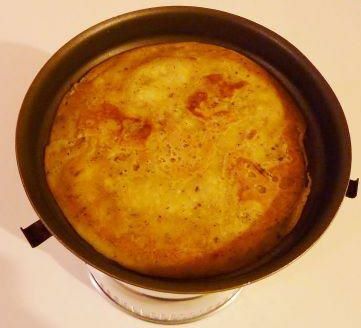 Post Your Camping Recipes at the Bottom of this Page, Share your Favourite Recipes and Outdoor Cooking Tips, Doesn't have to be cooked on a Trangia, we are Just Looking to Share Recipes, Tips, Ideas and Experiences for Everyone to Partake and Enjoy. 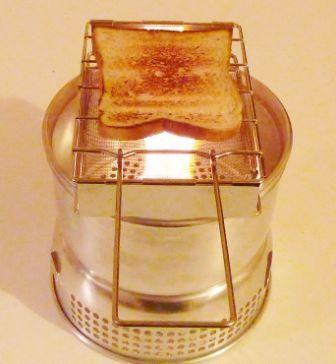 Toast on a Trangia stove ? 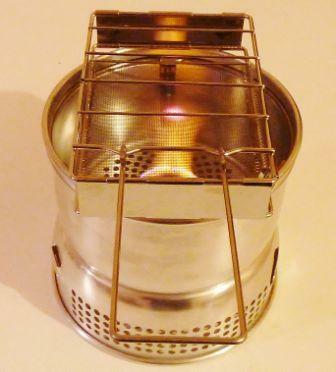 Ok, before we start the camping recipes section, there's a myth I would like to clear up, some of you think its not possible to make toast on a Trangia stove ? That use to be the case until the folding toast rack arrived on the market. The folding toast rack, simply fold the handle open and the rack itself opens up and locks in place, it has fine mesh on the bottom that heats up, grilling the toast without burning it. Place a slice of bread on the metal top bars and your good to go. In this example the stove being used is a Trangia 27, the toast rack sits nicely on the upper windshield, if you intend to use the larger Trangia 25 stove you will run into difficulties as the toast rack barely manages to span the 25s, upper windshield, you will need to hold the rack instead, preferably moving it slowly over the heat to get an even toasting of the bread, this is also advisable for the 27 stove as it reduces the risk of burning the toast. A word of advice, it literally takes just a few seconds for the toast to brown, so keep checking it every 10-20 seconds. Flatbread or unleavened bread requires no yeast or rising agent, very easy to make, a great choice for camping or bushcraft as the dry mix can be made at home and stored in a zip-lock bag or plastic container ready for your trip. There are lots of different flatbread recipes, here's my own flatbread recipe, I call it "Italian flatbread". 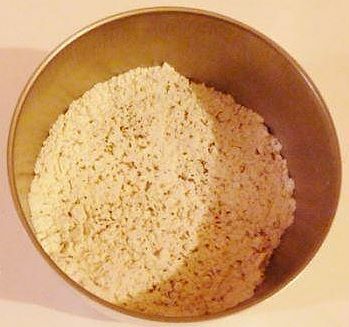 Put all the dry ingredients in a bowl, mix evenly, now add water and stir until the mixture is like cream or pancake mix, poor 4-5 table spoons of the mix into a lightly oiled hot non-stick frying pan, alternatively add less water and make the mix into a bread dough and roll it into a flatbread, I prefer the first method as it runs into the pan nice and thin without all the mess and faffing around of rolling bread dough. 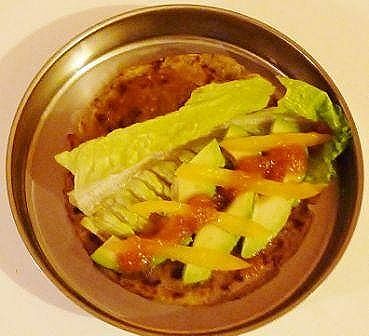 Let it cook on both sides until golden brown, then serve and add your choice of topping, I added salad, avocado,yellow bell pepper and tomato relish, they can be folded or rolled to make tortilla style raps, they can be eaten on their own or with any topping/filling you desire. Versatile camping recipes like flatbreads can be adapted and changed easily, eg, change the Italian seasoning and pepper for dried fruit and top with jam if you want a dessert, the possibilities are endless. Why not post and share you own flatbread recipes, lets see how many variations we can come up with ? 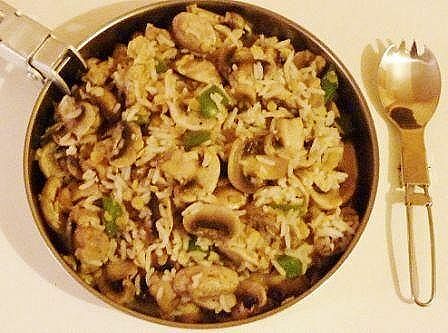 Simple mushroom stir fry is easy to make, for this example I have used shop bought white button mushrooms and green pepper, you could replace these with wild mushrooms and wild garlic or nettles, if your into wild foraging and know what to look for that's great, but when gathering wild mushrooms, if you don't know whats edible then never pick or eat wild mushrooms if your not 100% sure. Cook the rice and lentils together in a pan of boiling water (cooking time varies depending on type of rice and lentils) I use basmati rice and red lentils as they cook quickly and take the same time to cook, once cooked, set aside, then place the chopped mushrooms and peppers in to an oiled frying pan and cook until the mushrooms are light golden brown, now add the (strained) rice and lentils to the frying pan, stir fry everything together for 3-4 mins , then serve and enjoy. Share Your Camping recipes here ! Do you have a great camping recipe or outdoor cooking tip you would like to Share ? Please visit this page regularly as I will be frequently updating it with lots more camping recipes .